It’s that time again where we gather up some of the most viewed videos of Axial’s newest release. This time it’s the AX90058 SCX10 II 1969 Chevrolet Blazer. The following (in no particular order) represents some of the most viewed videos on the Blazer at the time of posting. Some are action videos, some unboxing and some include reviews of the truck. If you have or are interested in the AX90058 SCX10 II 1969 Chevrolet Blazer, then this is your go to spot to get information and impression of this exciting scale off-road ready to run rig. Description: Classic looks. Open-air top. Aggressive stance. These are just some of the characteristics that describe the gorgeous Axial AX90058 SCX10 II 1969 Chevrolet Blazer, a rig that’s as comfortable climbing to the top of a mountain as it is cruising on the beach. But this Blazer sports more than just a macho look. Additional items like chrome-coated grille, mirrors and door handles are included. Officially licensed Chassis Unlimited front and rear tube bumpers are mounted tight to the body for maximum clearance and a set of off-road light (with LEDs) shine some light when the action goes dark. To keep the Axial Racing SCX10 II 1969 Chevrolet Blazer rolling along in even the toughest situations, we’ve mounted it on our rugged SCX10™ II chassis. High-clearance AR44 high-pinion axles, a chassis mounted servo (CMS), re-designed AX10™ transmission case and tough steel suspension links are just a few of the parts that make the Blazer 4WD, ready to run, RC scale truck a beast on any terrain. Description: The Axial 1969 Chevrolet K5 Blazer is hitting the shelves and I’m excited to get my hands on one early. This truck is bigger than the normal SCX10-2 that we have seen lately, its much closer to the size of first SCX10-2 Cherokee body and also includes the hard molded grill, but this time in chrome! Check it out as we go deep into the details and differences of this truck vs any of the other available models! Title: Axial 1969 Blazer Unbox and Q&A! Description: (Video Recorded From Live Broadcast) I take a live look at the new Blazer bodied RTR offering from Axial, and answer your questions. Description: For some time now, there has been a rumor of a Chevrolet Blazer body in the works from the crew at Axial Racing. People have been eagerly awaiting to hear if the rumor is true. Well the time has come and it’s true, Axial has released their new Blazer body on their SCX10 II and this factory painted blue machine has lots of scale enthusiasts pumped for new builds. We managed to grab one of these new machines and give it our standard unboxing, feature breakdown, action segment and performance breakdown. Have you been waiting for a exciting new Axial scale RC trail truck? 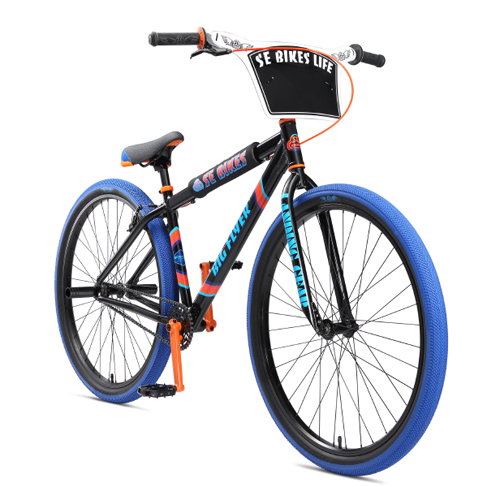 This just might be the rig you’ve been waiting for. Description: The Axial AX90058 SCX10 II 1969 Chevrolet Blazer has recently been announced and we showed you a rig that’s as comfortable climbing to the top of a mountain as it is cruising on the beach in its product launch video. Now we show you how it looks taking on another tough side of nature navigating through wooded trails and trudging through creeks. 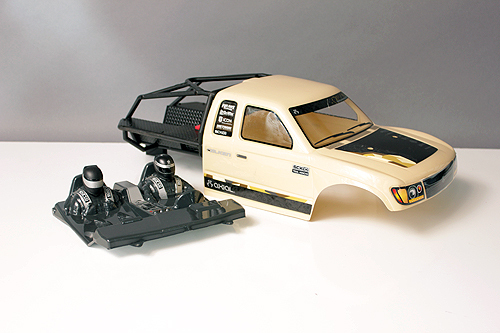 The Axial AX90058 SCX10 II 1969 Chevrolet Blazer comes ready to run with chrome-coated grille, mirrors and door handles are included. Officially licensed Chassis Unlimited front and rear tube bumpers are mounted tight to the body for maximum clearance and a set of off-road light (with LEDs) shine some light when the action goes dark. To keep the Axial Racing SCX10 II 1969 Chevrolet Blazer rolling along in even the toughest situations, it’s mounted it on the rugged SCX10™ II chassis. High-clearance AR44 high-pinion axles, a chassis mounted servo (CMS), re-designed AX10™ transmission case and tough steel suspension links are just a few of the parts that make the Blazer 4WD, ready to run, RC scale truck a beast on any terrain. This time next week, RC adventurists will be littering the mountainside of Cisco Grove California for Axialfest 2018. Many will have spent weeks, months and even the complete year since last year’s Axialfest preparing their rigs for the event. But one important area that should not be neglected is your day pack. You know, all the gear you should carry in a backpack to help support your day out in nature with your rig. We’re sure you have a pretty good idea of what you need to carry, but we gathered up the suggestions on what to carry from the Axial team that has been attending Axialfest since, well, since the start. Here is a list of what we suggest to have on hand. To carry your equipment, you will of course need a backpack. There are certainly an unlimited number of offerings available. But we have a few suggestions. For starters, make sure the pack is large enough to carry all of your supplies. Second, check for compartments. Having lots of storage areas makes it easier to separate things, know where they are and access them easily when you need it. Support is another area to check. Bags with batteries, water and tools can get heavy, make sure there are comfortable straps and cross support clips to distribute the weight of the pack on your body with minimal stress. And finally H2O equipped packs are often a nice option to keep you hydrated as you go. 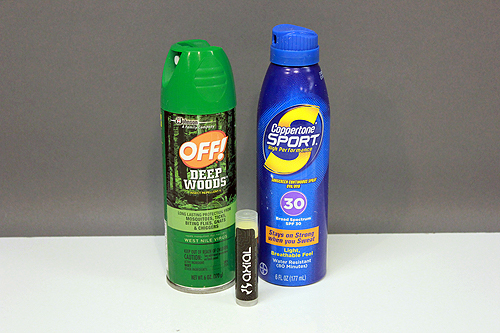 It can get a bit buggy on the trails so having some insect repellant is often a must. Next, sun tan lotion or spray, you’ll be in the sun, protect your skin. Lip balm is another item that many drivers will have on hand with them. It goes without saying, you should carry a minimized version of your toolbox with you. Some allen wrenches, nut drivers, scissors and pliers will probably get you through most repairs. Hex driver or leatherman style multi-tools help you reduce the amount of what you carry as well. 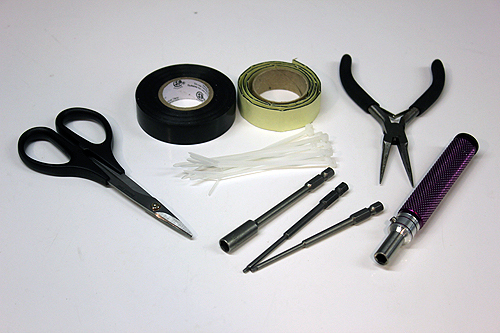 Tape, such as electrical tape, zip-ties and glue are also great for on the trial fixes. You’ll be out on the trails driving your RC rig for long periods of time and when the power runs out, you don’t want to be left carrying your rig back to camp. Have an extra pack or two safely stowed in your daypack. 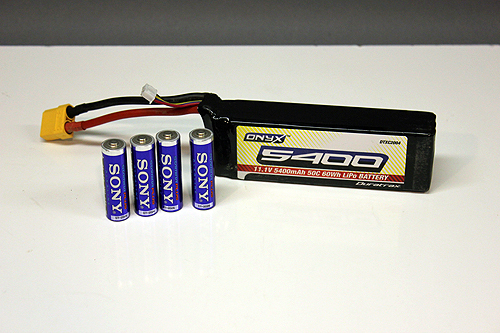 It’s also a great idea to carry some extra transmitter batteries as well. Sometimes time just flies away and before you know it, you’ve been out on the rocks for hours. 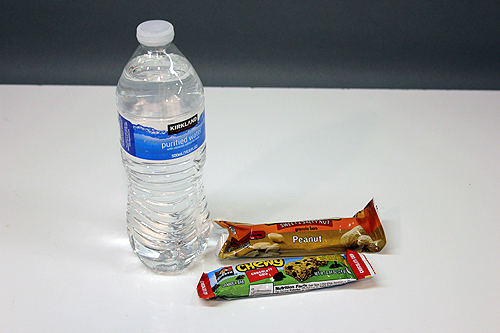 Always pack plenty of water and food to keep you going. Cisco Grove is at a pretty high altitude and with the heat of the sun, the combination can cause dehydration. Do not go out without water. Let’s face it, things can happen, especially with all of the highly modified rigs that will scour the mountains. 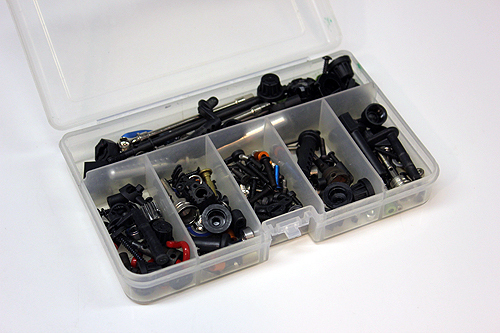 If you know the weak points on your build, it’s best to bring extra parts in case you need to make a fix. Have a box of assorted hardware on hand too. 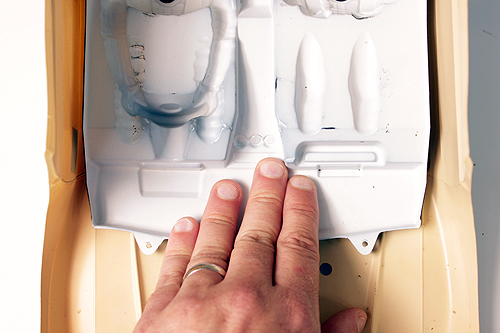 Even with lots of prep, sometimes screws or nuts can rattle free from your machine. You’re at perhaps the largest attended radio control event on the planet, make sure you document it! Have your cell phone charged, clear out the memory in your photo album and grab lots of pictures. Have a portable charger with you in case you need to recharge your phone. 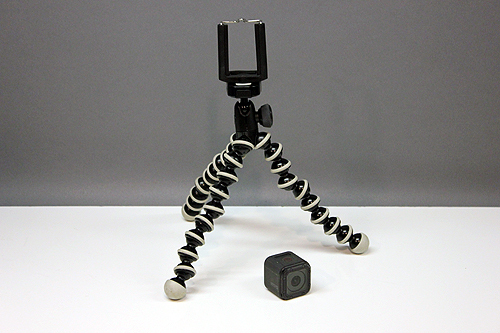 Action cameras and mini-tripods are also a must have. But unfortunately because of an incident at another unrelated event at Cisco Grove, drones are not allowed. Aventures run into the night at Axialfest so multiple sources of lighting are a must. A head-lamp is recommended as well as a flashlight. Have these items in your pack in case you’re on the trails for the long haul. So we just went over the recommended items to have on you at all times at Axialfest, but only you know what is truly needed to keep you safe and prepared on the trails. You took the time to make sure your rig was in top running condition. Now make sure you are too. 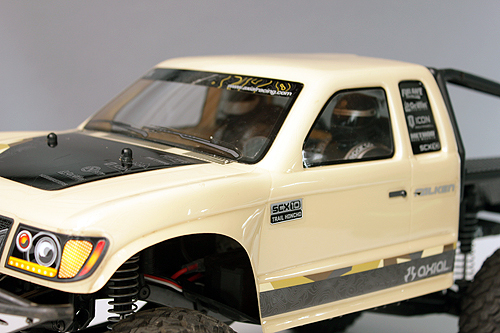 The Trail Honcho has been a long time favorite for RC off-road enthusiasts. It has an all business look with the large plate shielded front bumper, its recognizable cab and it’s tough cage rear section. When the SCX10 II Trail Honcho was announced, drivers enthusiasm again surged for this iconic machine in the scale crawling world. But this writer still felt it needed a little something else. You see, inside of that cool extended cab is, well, empty. You look into the windows and you see wires, a motor and a transmission case. Now the new transmission case does have a cool new scale look to it, however, it’s not something you’d expect to see if you looked into a cab of a scale truck. There should be an interior right? Agreed! So I started sifting through possible options for an interior. Drivers who run the SCX10 II 2017 Jeep Wrangler Unlimited CRC use the 2012 Jeep Wrangler Unlimited Rubicon Body as an interior. But there isn’t anything that is a true close fit such as that example. First I took a Deadbolt Body and held it up to the Honcho. This seemed like an ok option and then out of the corner of my eye was a 1/10 Yeti RTR interior. This interior seemed to fill the space in the Honcho cab a bit better. Interior found! In this Tech how to, we’ll show you just how easy it is to adapt the Yeti interior into the Trail Honcho for a better scale appearance. 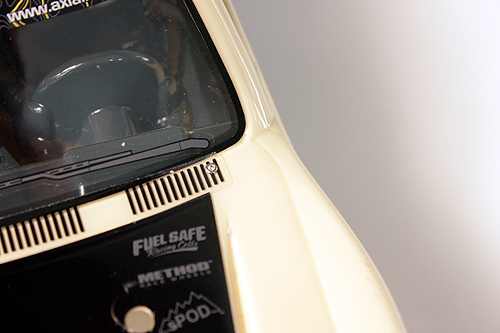 In this how to, we’re using an Interior from a 1/10 Yeti Ready To Run which comes painted. 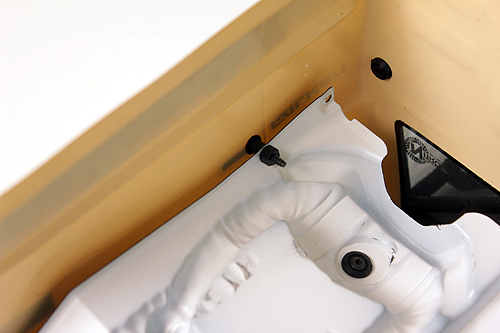 If you’ve purchased the Yeti interior as a stand alone part, you’ll need to paint it yourself. 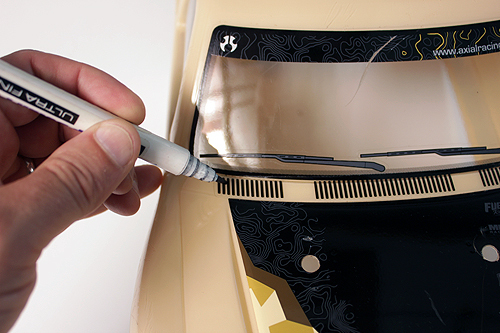 Take the time to wash the lexan with soap and water before painting it. 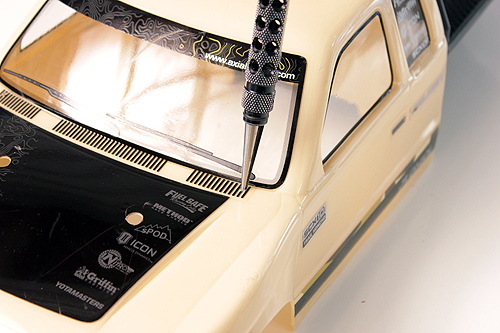 Paint in a well ventilated area and take your time and paint the body and or helmets to meet your custom scale needs. We want to secure the interior to the Honcho with screws so we need to decide where those screws should be located. To hide the screws as best as possible, we’re going to locate the mounting points in the hood vent area. 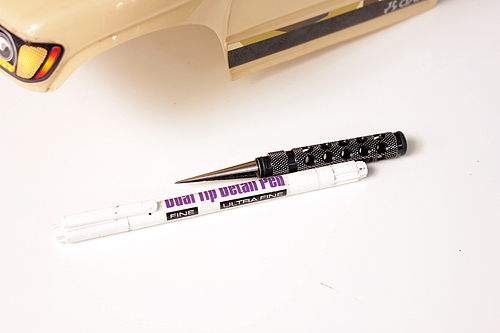 Using the marker, place a dot where you will drill the holes. Using your reamer or a drill bit, drill a hole on each side of the body in the vent decal area where your mounting points will be. 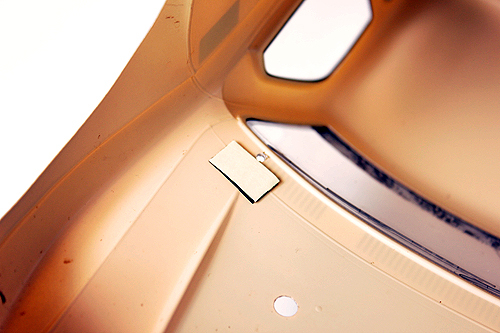 The holes should be slightly larger in diameter to the hardware you’ve selected to use. To help position the interior we’ve placed two small pieces of two sided tape on each side of the body to secure the interior. This will allow us to move and tweak its position before we use screws to mount it permanently. Once the interior is in position, press it down firmly to secure it to the two-sided tape on the body. 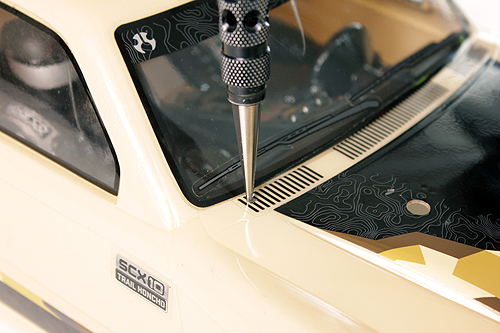 Now that the interior is in place, you can use your reamer or drill bit to open a hole in the interior, using the hole you previously made in the hood as a guide. With holes in the body and interior, you can secure the two together using the hardware of your choice. We found some small 1.6mm screws and nuts in our spares bin. Using smaller hardware looks a bit more scale. We’re not going to go through all the motions again to tell you how to make a hole, so we’ll give you the basic rundown on how to secure the rear. We chose to drill a hole through the “Keyhole” on the Honcho’s door handles as the spot to locate the hardware that will secure the interior in the rear. We then ran a long drill bit into the interior and drilled a pilot hole. With some long screws we found in our hardware bin and some plastic nuts and shoulder spacers we found in our Axial spares bag, we secured the back half of the interior on each side. A few Axial option parts, a little paint and just a few minutes with some basic hobby tools and hardware you probably have lying around, you now have an interior for your Honcho that fills the cab space and hides all of the inner workings of the SCX10.